However, among the few tidbits allowed during my Singaporean girlhood — as just an occasional treat — were Japanese cookies and chocolate snacks. These bite-sized morsels were adorable — panda-shaped cookies filled with oozy strawberry filling, thimble-sized chocolate “hamburgers,” tasty biscuit sticks I’d pretend were cigarettes as I held them between two fingers, slowly nibbling them down to nubs. 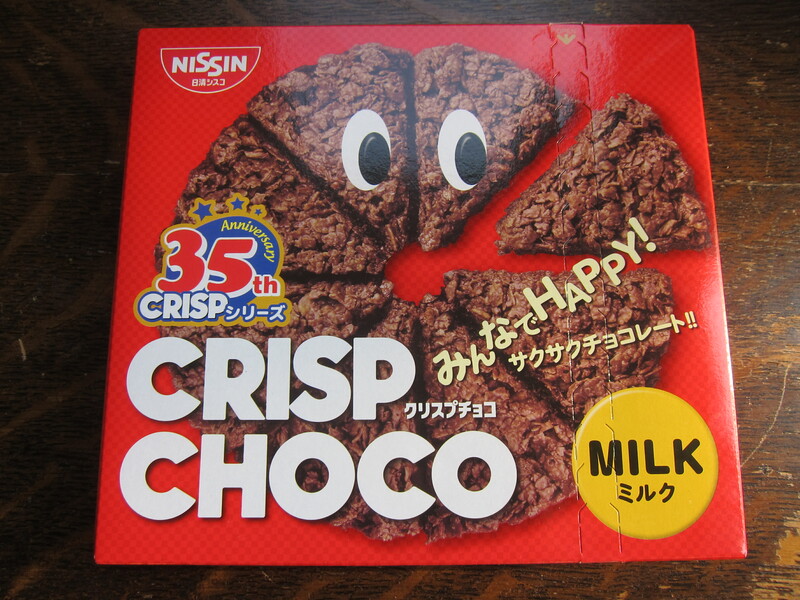 But my favorite was something very basic: Crisp Choco, a milk-chocolate pizza-like pie made with compacted chocolate cornflakes. In the grand scheme of things, this snack doesn’t seem terribly sinful — it’s not a rich molten chocolate cake or mound of bacon, after all. But it was a treat that we looked forward to — one I count as a guilty pleasure I now allow myself just a few times a year. … you’ll see that it looks rather different from my picture above. That’s because when I tried to fashion my melty chocolatey cornflakes into a flat pie, it resembled, well, something rather unappetizing. So, into little decorative cups my cornflake mix went instead. 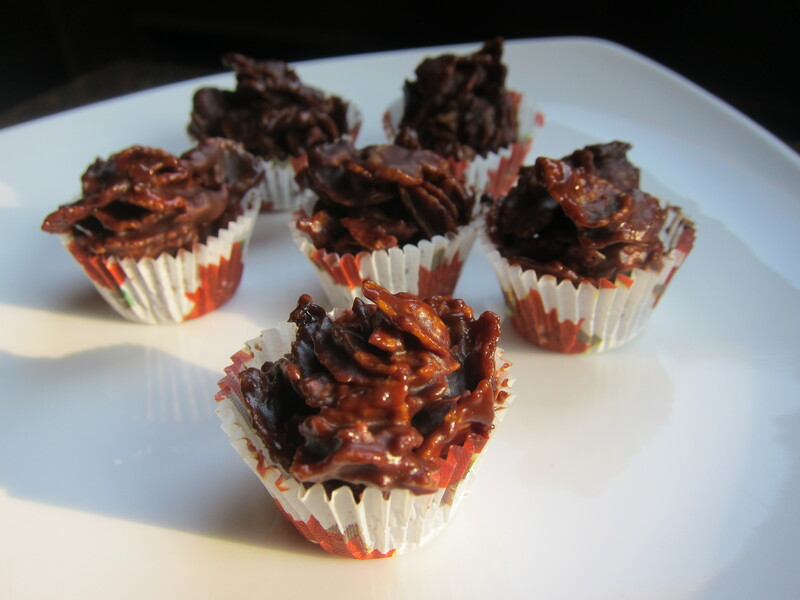 Now these are ridiculously easy to make — you melt some butter, chocolate and honey or golden syrup in a pan, stir it until that’s nicely mixed, then pour that over cornflakes and mix that well. After 10 or so minutes in the fridge, this guilty pleasure will be ready to go. The only problem is, these can be a little addictive. But you know, that’s just part of what makes them a true guilty pleasure. Don’t forget to check out other Let’s Lunchers’ guilty pleasures below! And if you’d like to join Let’s Lunch, go to Twitter and post a message with the hashtag #Letslunch — or, post a comment below. Place cornflakes in a bowl and lightly crush them — don’t want to have giant flakes but you don’t want crumbs either. Heat butter, chocolate and honey or golden syrup in a pan over low heat, stirring frequently, until melted and well-mixed. Pour the mixture over the cornflakes and mix well until the flakes are all coated. Either do tablespoon-sized drops of the mixture onto waxed paper placed on a baking sheet or spoon it into tiny paper baking cups. Or, if you’d like, form it into a 1/2- to 3/4-inch thick flat round, just like the snack. Cool this in the refrigerator until it’s set, about 15 minutes.